This is the twenty second post of our series of projects to make us thankful for DIY. Be sure to check back everyday during the month of November for new simple and easy DIY projects. We're always losing our remotes. This isn't a unique problem, I hear it happens in many families. We also have a two year old who finds new homes for remotes. This would be places like the garbage can, in between couch cushions, and in small spaces in other rooms. Actually, we do have a nice side table right next to the couch with perfect drawers for our remotes. The thing is, it's a drawer that the two year old opens easily and enjoys taking everything out of it. This is also true with our coasters. Most of the time, the two year old likes to hide them and send mom and dad on a game of hide and seek. One thing we've thought about as an answer is to install a floating style shelf where the remotes and coasters can be kept hidden so little hands can't reach them. If you're also looking for solutions for a secret compartment to store your gun or maybe keys to a safety deposit box, try this project by Glen at DIY Creators . 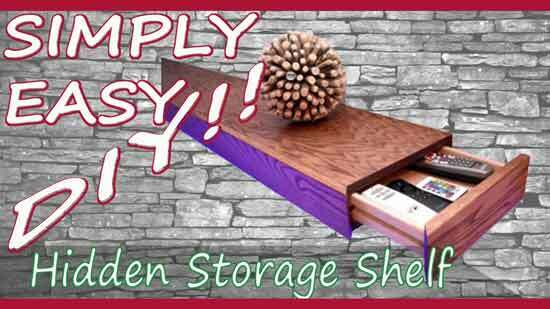 I hope you enjoyed today's featured project and don't forget to stop by "DIY Creators" YouTube channel to check out even more great DIY and woodworking videos from Glen. Don't forget to subscribe.